• The scriptural 24-hour day begins at sunset on the first date with gray background. • The daylight portion of the scriptural 24-hour day is in red type. *For information regarding the Jubilee Year of 2045 please refer to the free publication by Qadesh La Yahweh Press which is titled: The Sabbath and Jubilee Cycle. • Days begin at sunset on the first date with gray background. • If the conjunction of the sun and moon occurs between sunset and sunrise, the night portion of the 24-hour day, this would indicate that the conjunction occurred within the last day of the month. Therefore the next sunset would mark the beginning of a new month (moon). • Conversely, if the conjunction of the sun and moon occurs between sunrise and sunset, the daylight portion of the 24-hour day, the next sunset would mark the beginning of the last day of the month (moon). Therefore the beginning of the new month (moon) would occur at the second sunset after the conjunction. The Beginning of the Year. New Moons – Visibility or Calculation? Also see The Festivals and Sacred Days of Yahweh. The Scriptural International Dateline – Part 3. Days begin on the first date at sundown and end on the second date at sundown. 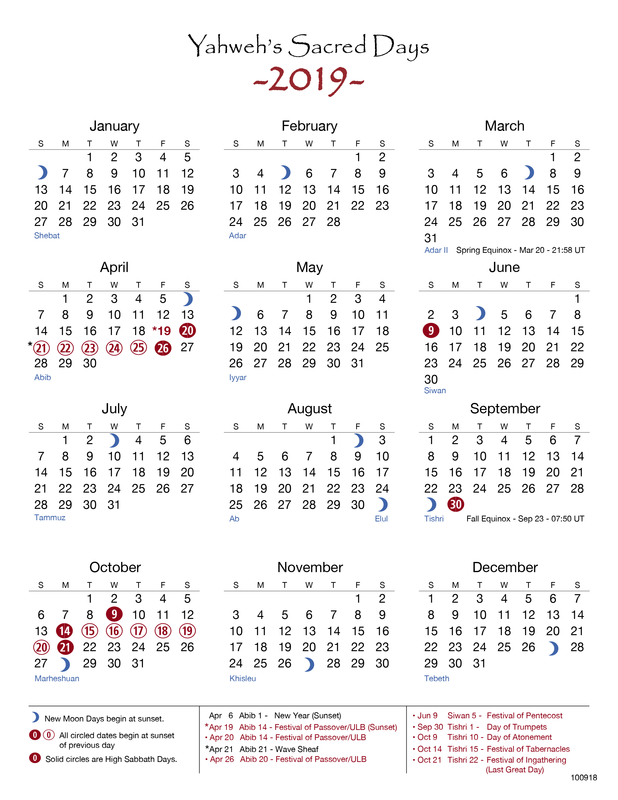 Dates and days marked in red indicate the daylight portion of the High Sabbath Day which begins at sundown of the previous day. Abib 1 is beginning of Year 24 of the 70th Jubilee cycle calculated from the time that the Israelites observed the first Jubilee cycle in 1386/1385 B.C.E. in the land of Kaanan. The event of the Exodus took place in 1439/1438 B.C.E., Abib 1 to Abib 1 reckoning. There are 26 years remaining until the next Jubilee which begins on Abib 1 of 2045. For more information see The Sabbath and Jubilee Cycle. (b) Passover Day begins on the 14th day of Abib and is Day 1 of the 7-day Festival of Passover/Unleavened Bread. (Exod. 12:6-20, 13:3-10, 34:18; Luke 22:7) High Sabbath and Sacred Convocation. For more information see The Festivals and Sacred Days of Yahweh. (c) This is the day of the Wave Sheaf Offering which is the day after the weekly Sabbath of Passover Week (Lev. 23:9-11). 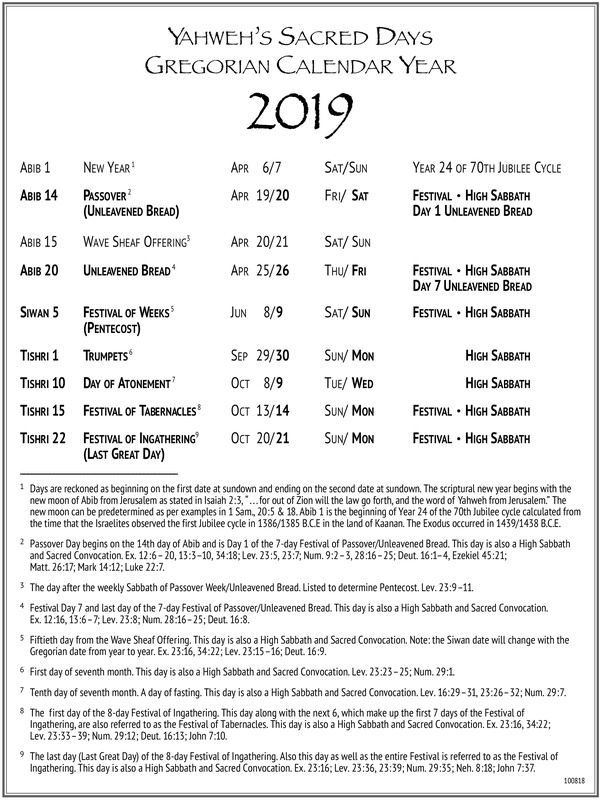 Listed to determine date of Pentecost (Festival of Weeks). Not a High Sabbath or Sacred Convocation. (d) Festival day 7 and last day of the 7-day Festival of Passover/Unleavened Bread. (Exod. 12:16, 13:6-7; Lev. 23:8; Num. 28:16-25; Deut. 16:8). High Sabbath and Sacred Convocation. (e) Fiftieth day from the Wave Sheaf Offering which is the day after the weekly Sabbath day that occurs during Passover Week. (Exod. 23:16, 34:22; Lev. 23:15-16; Deut. 16:9) High Sabbath and Sacred Convocation. For more information see The Festivals and Sacred Days of Yahweh. (f) First day of the seventh month. (Lev. 23:24; Num. 29:1) High Sabbath and Sacred Convocation. (g) Tenth day of the seventh month. A day of fasting. (Lev. 16:29-31, 23:26-32; Num. 29:7) High Sabbath and Sacred Convocation. (h) Festival Day 1 of the 8-day Festival of Ingathering. According to Scriptures, this first day along with the next 6 also constitute the 7-day Festival of Tabernacles. (Exod. 23:16, 34:22; Lev. 23:33-39; Num. 29:12; Deut. 16:13; John 7:10) High Sabbath and Sacred Convocation. (i) Festival Day 8 (Last Great Day) of the 8-day Festival of Ingathering. In particular, this single day as well as the previous 7 days are collectively referred to as the Festival of Ingathering. (Exod. 23:16; Lev. 23:36, 23:39; Num. 29:35; Neh. 8:18; John 7:37) High Sabbath and Sacred Convocation. Enter your email address in the box below to subscribe. Please click on the "Topics" tab for a complete listing. Over 80 posts! Qadesh La Yahweh Press Excellent source for in-depth scriptural studies. Copyright © 2012-2019 | Yahu Ranger Report. All rights reserved.